Documents in the website relate to parishes and place names within the old Ewyas Lacy Hundred and neighbouring areas in south-west Herefordshire and Wales. The links below show documents grouped by place name for browsing. 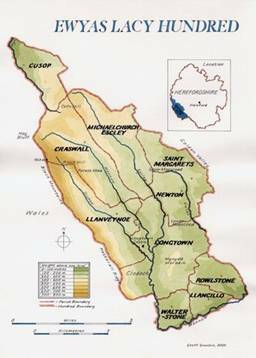 Documents relating to parishes reflect an evolution in the nature of parishes; some communities with their own churches were formerly known as ‘townships’ in the parish of Clodock, principally Craswall, Llanveynoe, Longtown and Newton. Thus documents relating to Clodock may also refer to one or other of these townships, as for instance ‘Newton in Clodock’; in such cases the links below will contain 'duplicate' entries under each place. Today, Clodock is now amalgamated with Longtown as a single parish, and all the others listed are separate parishes in their own right. Material referring to neighbouring areas can be found through the links below. The search engine should be used for other place names.